Thanks to Graham Howard of smilersinfo.co.uk for passing on the news that the West Ham United Commemorative Sheet, first mentioned by Royal Mail back in the winter, has now been made available (though I haven't checked to see whether it is on their website). 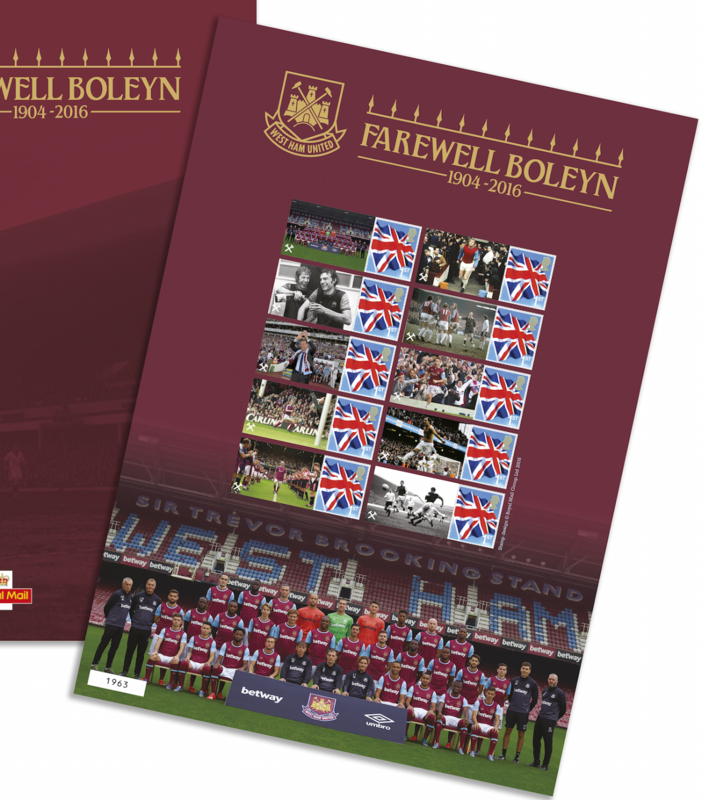 Entitled 'Farewell Boleyn' (ahead of the team's move to London's Olympic Stadium) the sheet shows the assembled squad in front of the Sir Trevor Brooking Stand at the ground universally known as 'Upton Park', but originally known as 'The Boleyn Ground', and referred to as that again because the corporate wizards decided they wanted to remember their roots, or somesuch. The club rented Green Street House and grounds in the Municipal Borough of East Ham from the Roman Catholic Church from around 1912. Green Street House was known locally as Boleyn Castle because of its imposing nature and an association with Anne Boleyn, who had either stayed at, or as some believe, owned the house. Hence renting the grounds of "Boleyn Castle" the name Boleyn Ground came into being. Today the ground is far more commonly known as Upton Park, after the area of London in which it is located. Anyway, back to the stamp sheet. The stamps are the Union Flag, with 10 different labels. The sheet is printed by ISP in litho, self-adhesive. In a limited edition of only 10,000 and designed by "Royal Mail and West Ham Design Teams', the folder was produced by Zentih Print and Packaging. The Royal Mail product code is VA285 and the price is the usual £14.99. The first day of availability was 18 May 2016. UPDATE 8 JUNE: I've now seen the sheet, and it's folder, and I'm disappointed that on this occasion there is no information about the images on the labels. Sure, we all know Bobby Moore, and die-hard fans will recognise all the recent players, and most of the black and white ones, but it wouldn't have taken Royal Mail and WHU much effort to have put this information either on the sheet or in the folder. In years to come, future owners of the sheets may have questions. I can confirm it is available on the RM website - I ordered mine yesterday. Lots of clubs have moved grounds without being surrounded by all this cheesy hype. A Royal Mail commemorative sheet for a club with a very (VERY) modest record of success down the years? Talk about London media bias. I'm sorry, but that is a ridiculous comment. 2. This is a product which has been commissioned by the club, and produced with the assistance of Royal Mail. 3. A similar Commemorative Sheet for the 150th anniversary of Notts County was produced by Royal Mail 4 years ago (http://blog.norphil.co.uk/2012/08/commemorative-sheets-for-notts-county.html) They won the FA Cup in 1894. West Ham have won the Cup three times. 4. These (and others) are not aimed primarily at stamp collectors but at people interested in the subject matter. That's why a similar sheet for Cambridge University sold well to alumni, and so on. Although I'm not an Eastender, I've been a West Ham Fan since 1964 (full disclosure of my bias made). So I think the sheet is just as valid as the Notts County, Middlesex Cricket Club or many other such souvenirs issued over the years. The sad thing in my opinion is the hype about "limited editions of ONLY 10,000" etc. The limited edition Notts County sheet, for example, is still available from Royal Mail after some three and a half years! There's a chance they might win the FA Cup again before these limited edition sheets are all "snapped up"! More Machin variants likely later this year. Post and Go Naval Museum Update. Time for a new approach, and this isn't it!